La Creature Boutique, my new supplies shop, is now officially open. 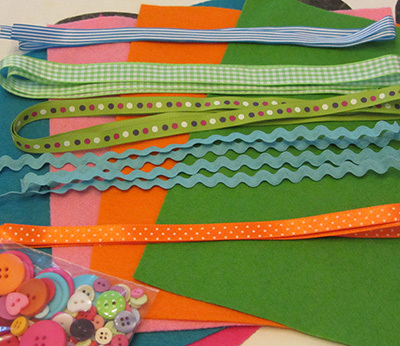 I stock stylish and cute needlecraft supplies such as buttons and ribbons. La Creature Boutique is also the place where you will find some useful notions such as magnetic fasteners or brooch pins. As a felt lover, I had to have a felt range. Let me tell you this: you’ll have to love this soft 30% wool felt which comes in 20 lovely colours. And there is more to come so watch this space! All my supplies are shipping from Ireland. However I source them all over the world, getting them wherever they offer the greatest quality. I try and keep the prices down so everybody get to make some feel good needlecraft. I wanted to share my love for stylish needlecraft supplies with my readers. After making all these tutorials, I have built a pretty nice stock of supplies. The thing is I love the thrill of the search for the perfect supply. I figured out that by buying in bulk I could 1) get my hand on good stuff for less 2) share the excitement of discovery with my readers 3) develop an income that would allow me to keep going with the tutorials. To celebrate the launch of La Creature Boutique, let’s have a giveaway. The lucky winner will get 5 sheets of this soft felt (in my favourite colours), 5 meters of cute ribbons and 50g of mixed size and colours buttons. Yes, ALL this (which is worth €12). How good is that? share the news on Twitter or Facebook (and let me know you did). You can enter until Sunday 7th October at 5.00pm Dublin time. The winner will be randomly picked from list of all entrants. The giveaway is open worldwide, you can enter wherever you’re located in the world. Good luck and see you all at La Creature Boutique. Next Post How to find time to craft? Congratulations! I hope it goes well for you. Thank you guys for your support, and well done for being the first bunch of entrants for the giveaway! Congratulations for your lovely opening! Congratulations and the best of luck with your shop. Really love the great range of colours in the felt. It can be so hard to get the right balance between the pretty colours and quality! Delighted to see a good supplier here in Ireland. Thanks Emma, I also like to have some choice colour wise. I’m following you on Twitter as emmabo26. I liked your Facebook page also. wishing you lots of customers in your new shop. The things you’re selling are really cute and even irresistible! So excited to find your website…..was about to purchase elsewhere before I found it. Congratulations and good luck. Congratulation on the shop and being a blog finalist.